Lee Edward Dryer- Age 55, February 1, 2019. A loving husband, father, brother and friend. He served in the U.S. Army. He was a graduate of Vanderbilt University School of Law. He was a former Assistant District Attorney in Williamson County. 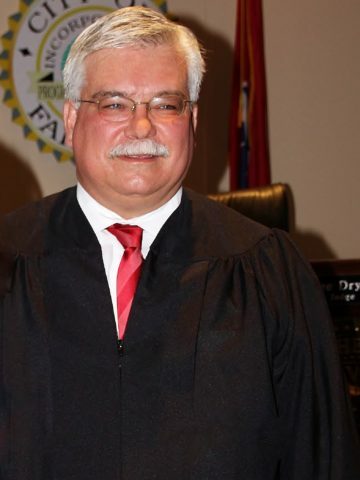 He was an Attorney at Law and a Judge for the city of Fairview. He enjoyed volunteering and being active in his community. Visitation will be from 5-8 p.m. on Tuesday, February 5, 2019 and Wednesday, 1-2 p.m. at Harpeth Hills Funeral Home. A Celebration of Life Service will be at 2 p.m. on Wednesday at Harpeth Hills Funeral Home. The interment will be at a later date at Riverside National Cemetery in Riverside, California. So sorry to see you leave so early in life my Brother RIP mr. Dryer Happy Trails, prayers for the Family. God created man in His own image. Man’s purpose was to grow and become a strong reflection of his God. To minister, to serve and to glorify God, the Creator. That is a summary of the life of Lee Dryer. Lee Dryer was a unique creation. None other like him has ever existed. Lee knew who he was and had a broad and deep understanding of all the people he knew and served. compassionate, forgiving and loving to all – even to the unlovable. He possessed high standards and operated within a framework that demonstrated the fact that each of God’s creations has a divine purpose in life. Lee understood his purpose and moved forward toward fulfilling it in a godly manner. He served mankind with concern and integrity. Even though he understood the world with it’s challenges, obstacles and disappointments, he was pained for those who did not see the value of respecting themselves and of caring for others. So he constantly worked to make the world a better place. He had many friends. He found the love of his life in Juany and with her he worked and contributed greatly to make the professional world, as well as society, more healthy and dignified. even though we will miss him, we are so grateful for the friendship we shared and are comforted to know that Heaven is a better place to have received such a tremendous reflection of God’s image, love and care pass through the gates to brighten Heaven for eternity. R. I. P my friend I’m still at loss for words!!!!!! I have no real words that could capture what Lee was to me. A dear friend, a brother, a wise counselor. The world has a huge hole in it today. Lee Dryer was a great man; my condolences to his friends and family. I am deeply saddened by the loss of your presence in my life and the kind & encouraging words you often shared. You are the type of angel God needs in Heaven to help save those of us still on Earth. May you and your family have peace. I cannot wait until we meet again at the feet of our Lord and Savior. I only knew Lee Dryer for a short time, but I was blessed and will be forever changed by the words of wisdom, support, and encouragement he gave me. I wish all judges were as upright as he was and if most people would make half the effort Lee made to be the best they could be and do the most they could for others, what a wonderful world this would be. Prayers to the family. So sorry for your loss. He always had a smile on his face when I saw him and he was such a sweet man. Thank You Lee Dryer for being my friend. I will always remember our long talks. I will remember you were the man who loved people unconditionally. I would of not made it through that part of my life without the many laughs we shared. God Bless My friend. I know your shining bright. Thank you Lee for helping me in the memory of my Daughter Stacey would have been so proud of making some so negative and turning around to help me Bless so many.You have a award waiting.Going to miss you my special Friend.You have a crown waiting for you. The best friend I ever had, the closet friend I ever had. If Lee Dryer was your friend, then you had a friend for life. He played a very important role in my life for many years and there is a gaping hole in my heart from his departure. He left us way too soon but if our lord is soon to return to this earth as many of the population believe then I understand why he has called our Lee home, It seems our lord Jesus needed a capable and competent commander to stand by his side when he makes his return to earth. He could not have found a stronger man in faith and commitment than Lee Dryer. The forces of good are assured a victory with Lee on their side. I love you and miss you my brother. Juany and Lee were much in love and to them I always felt that everyday was their honeymoon. They were the happiest couple I know and two of the most incredible human beings on this face of the planet. I am proud to have sat around their table many nights, many holidays, sharing a meal, solving the world’s problems and just enjoying each others company. I will miss you both. I will miss Lee’s laugh, the twinkle in his eye, his bad jokes, his efforts to solve the problems of his friends and clients, his radio show, his seven day a week, late night phone calls, his fair and honest efforts on the bench, his masterful courtroom prose, his love of life and his incredible ability to at once see thru the most difficult issues and offer simple resolve to complicated problems. Man, do I miss him. My condolences to Juany and the family for Lee’s untimely loss to cancer. Lee was a fine and jovial human being. Will be missed dearly. What a great man god created! What a n outstanding friend! Too soon. Glad I got to see you and close a chapter of my life two weeks before god took you home! God bless your wife and family. Enjoy heaven you deserve the beauty and elegance heaven has to offer. So sorry to hear this news he was a very kind and caring man. I wish all lawyers and judges could learn from him.He always put his clients first and always wanted to help the “ little” guy. Lee Dryer was a Good Man. I only got to know him and Juany when he was Running for Judge in Fairview. Lee and Juany always treated me good. They took me to my first Race track Kentucky Downs. We Volunteered together and put flags on Veterans Graves on Veterans Day. I will miss you Lee Dryer. You and Juany made this world a better place. Juany I’ll miss you but being with family is important especially in times when we lose our great Love. I’ll never forget either of you. It’s been said that people come into our lives for a reason, bearing something we must learn to help us to grow that is If we are open to them as we help them in return. Your simple acts of kindness in life left a great many of us walking in different paths. Thank you for all you’ve done. Lee was an extraordinary man and friend. He was a gifted prosecutor and attorney who took time, early in my career, to show this rookie police officer how to make, present, and win great cases. I will forever be in Lee’s debt for showing me the ropes and helping me become the professional I’m evolving into. We’ll miss you, Lee. Lee Dryer, may you rest in peace sir! It was a pleasure knowing you and working with you over the years in Williamson County. The zest you had for defending your clients was well known and appreciated by many. My prayers go up for you and your family.